Solar Impulse is the first airplane to fly day and night on solar power alone. To be clear folks, that means 22,000 miles without a single drop of fuel. Run on Sun has been following the exciting developments of Solar Impulse since it’s prototype began its groundbreaking test flight across America in 2013. After the lessons learned from the American flight, an upgraded Solar Impulse 2 was developed with a wingspan wider than a Boeing 747, more than 17,000 solar cells and 1,300 pounds of batteries. Amazingly, the aircraft still weighs no more than an average car! Finally, this morning, on March 9th, 2015, Solar Impulse 2 and her team were ready to embark on their record-breaking aeronautical journey around the world. The first leg officially departed from Abu Dhabi at 7:12AM UTC+4. Landing in Muscat, Oman at 20:13PM UC+4 pilots Bertrand Piccard and Andre Borschberg rested for a few hours before continuing onward to Ahmedabad, India. With a top speed of 50 mph, the entire circuit is planned to take four or five months before returning safely back to Abu Dhabi. You can follow their flight online as well as chat with the mission control center and view cockpit measurements like solar battery storage and pilot heart rate! 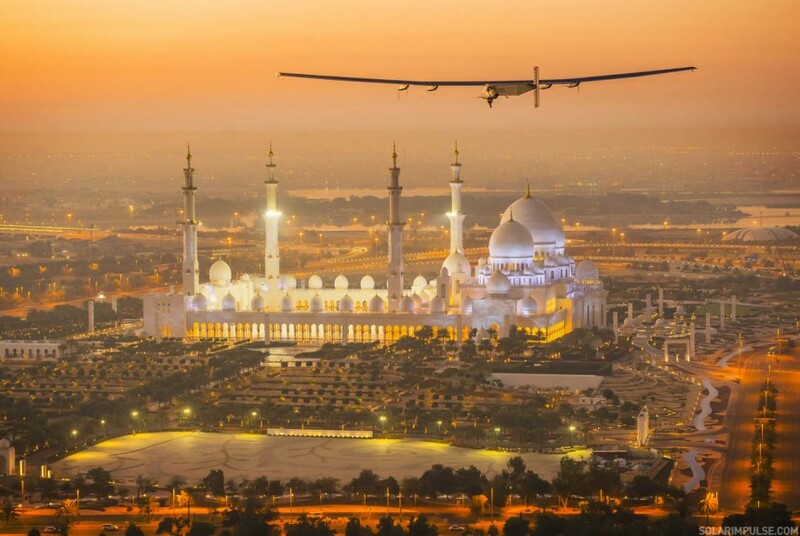 Solar Impulse is not only about accomplishing the first round-the-world solar flight. Behind the development of this technological feat lies a very powerful message. Piccard and Borschberg are using each landing as an opportunity to reach out to governments, NGOs, education centers, and the broader public to share what is possible with clean technologies. In conjunction with Solar Impulse’s round-the-world flight, the pilots started an online campaign called “Future is Clean”. In December 2015, they will share the largest collective voice in favor of clean technologies with global leaders at COP21, the United Nations Climate Change Conference in Paris. You can add your pledge and share with your networks at www.futureisclean.org.